Check Out Some Other Posts! 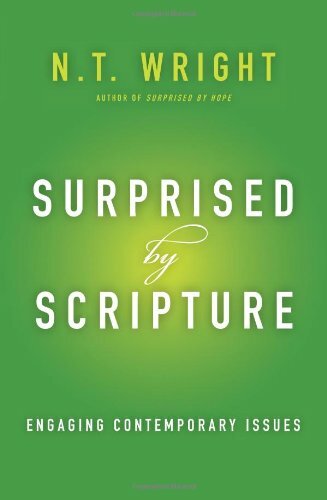 Recently, I finished NT Wright’s book, “Surprised by Scripture.” Although I wasn’t too “surprised” by some of the things he said (anyone who has read anything by him will not be too surprised by his points), I was encouraged and challenged to see things a bit differently. Something Wright said at the beginning of the book stuck with me throughout the rest of the book and it spurred me on to think through exactly what the evangelical church in America is teaching. Does the message that we preach through our lives echo the Gospel? Or does it simply reiterate what current philosophies of the day have to say? Sometimes I believe that we simply take the current philosophies and add a Christian-themed twist to them. Perhaps this is why Christianity isn’t thriving like it should. Let’s look, for example, at the American Dream. Our current philosophies say to pursue that dream. Buy a house. Climb up the ladder as quickly as possible. Get a family. Have the new and best of everything. Build your retirement fund. Go into debt to appear successful. Currently, I believe that sometimes the message of the evangelical American church tends to look something like, “how to have it all and still follow Christ.” Even some churches look like this. They buy the best technology, build the biggest buildings, go into debt to appear successful, etc. All of this is in hopes that they might attract people to see Christ. I believe this is admirable, but I can’t quite buy into it completely. In church jargon, attractional is this idea that you bring people to church to encounter Christ. Perhaps, taking Wright’s statement into play, this isn’t a terrible idea. Jesus’s message always struck a chord with the tax collectors, prostitutes, lepers, and others whom society and religion had deemed a minority. It struck a chord with anyone who questioned the leading philosophies of the day. It still can. Christianity should thrive among the poor. We hear this all the time, but it is still true. In a culture obsessed with money, our message simply cannot be one of how to give to God and get a great tax write-off. It should thrive among those who have nothing to give because God isn’t looking for money. He is desiring people. Christianity should thrive among those who may never own a home or a new car or have a nice 401K. Christianity should thrive among the child molesters, rapists, and other sexual outcasts. When society gives out a scarlet letter, Christianity should be showing a redeeming story. I have read story after story of individuals who have no life anymore because of a mistake. This should never satisfy a Christ follower. They are outcasts of society. We shouldn’t celebrate that. We should redeem that. Christianity should thrive among that. Christianity should thrive among those who are dying of communicable diseases. With the recent Ebola fear that is plaguing Americans (for some reason), we cannot simply run and hide like the rest. Our response can’t be to cast them out of society. Our response has to be one of love and empathy. Of no fear. Simply put, Christianity has always thrived among those who realize that they have nothing. It’s harder to realize that you have nothing when you are constantly surrounded by everything. This past summer, I went to Baltimore on a mission trip with some of my students. While there, we worked with an inner city organization that gave to those whom politicians and the rest of society had forgotten. To be remembered by someone was the Gospel to them. I remember having a conversation with the head of the organization asking him how to translate something like this to the suburbs. He looked at me and said, “I have no answer for that.” I then proceeded to ask, “Will it take a complete wrecking of dreams, possessions, and careers, for the Gospel to penetrate lives? And if so, what message should we speak until then?” Once again, he had no answer. Maybe because the answer was too difficult to speak.